Step 1 In a large pot of rapidly boiling, generously salted water, add the sugar snap peas. Cover the pot and bring back to a boil. Uncover and cook until the peas are tender but still a vibrant green, 6 to 8 minutes. Do not cook so long that they turn drab. As soon as the peas are done, drain them and place them in an ice water bath to stop the cooking and preserve their bright color. Drain them again. Step 2 While the peas are cooking, cook the shallots in 1 tablespoon of butter in a small skillet over medium-low heat until the shallots are tender and translucent, about 5 minutes. Set aside. Step 3Place half of the peas in a blender and puree until very smooth. Add a tablespoon or two of chicken stock, if necessary, to keep the mixture flowing. Add the remaining peas and the cooked shallots and finish pureeing. Step 4Pass the pea puree through a strainer into a bowl, pressing with the flat rubber spatula to work it all through. Rinse the spatula blade to remove any fiber and scrape the thick pea puree that sticks to the outside of the strainer into the bowl. Discard the fiber that is left behind inside the strainer. Step 5Stir in just enough chicken stock into the puree to make it a flowing liquid. It should have the consistency of fairly thin split pea soup. Stir in the salt, a few gratings of nutmeg and lemon juice. Taste, and if the peas aren't bright and sweet, stir in enough sugar to correct. If necessary, add more salt and lemon juice as well. The recipe can be prepared to this point up to 8 hours in advance (any longer and the color will start to fade). Refrigerate in a tightly covered container. Step 6Pass the puree through the finest strainer you have into a saucepan. Warm over medium-low heat until the mixture is bubbling. While the puree is warming, cook the cream and Parmesan in a small saucepan over medium heat just until the Parmesan melts and the cream is thick enough to coat the back of a spoon. Step 7When the puree is hot, stir in the remaining 1 tablespoon of butter. Taste once more and adjust the seasoning if needed. Divide evenly among 6 warmed soup plates. Gently shake each plate to distribute the puree in an even layer. Spoon some of the Parmesan cream into the center of the puree in a rough "C" pattern. Serve immediately. In Recipes-list.com we have selected the most viewed recipes from category - Best recipes Main courses Quick and easy Soups . Enjoy the best recipes specially selected for you! 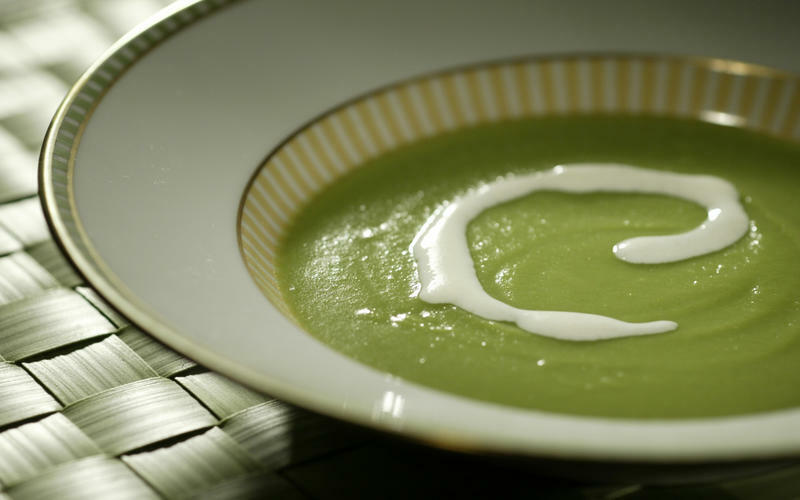 Sugar snap pea soup with Parmesan cream is the right choice that will satisfy all your claims.